SURF is a community-based organization that empowers youth as integral agents of change in the sustainable development of their communities. SURF is founded on the belief that youth are a fundamental resource in promoting responsible community development and creating a healthy future for themselves and their communities. 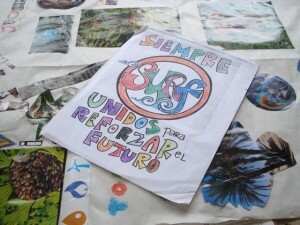 In Bahia Ballena, Osa, Costa Rica, SURF provides youth the opportunity to participate in capacity-building programs that enhance their quality of life, help them gain employment options and improve their decision-making processes. Costa Rica covers less than 1% of the earth’s surface area but contains 5% of the world’s biodiversity. It has 26% of its 52,100 km2 of land under protection, but less than 1% of its 580,000 km2 of marine territory under protection. SURF’s program operates in Bahia Ballena, Osa, a region that includes 149,808 hectares of protected areas including three national parks, two reserves a wildlife refuge and a marine national park. The Osa area contains an incredibly diverse set of ecosystems that are currently being threatened by unregulated tourism, pollution, illegal extraction of floral and fauna and commercial and real estate development. The community of Bahia Ballena is located at the footsteps of Marino Ballena National Park, Costa Rica’s first Marine National Park, which was established in 1989. The park is the main tourist attraction in the area and plays a key role in the community’s socioeconomic development. Conservation efforts in the Marino Ballena National Park and the greater Osa region can be improved by empowering youth as integral agents of change in the sustainable development of their communities. SURF is based on the education methodology: Tell me, I’ll forget; Show me and I may remember; Engage me and I’ll understand. Students participate in hands-on activities around their neighborhood through which they gain a deeper understanding of their community, its needs and the steps they can take to bring about institutional change. SURF participants learn GIS and GPS mapping techniques so that they can create comprehensive maps of the greater Bahia Ballena region. They go on excursions into the Marino Ballena National Park and coastal mountains to learn about relevant topics such as whale migration and the origin of their town’s potable water. SURF’s curriculum is divided into four modules called “The Four Waves” that encompass six months of weekly sessions. Each wave contains trainings, workshops and extra-curricular activities that engage students with their community and marine protected area. As students progress through the Four Waves, they participate in activities that encourage self-awareness by connecting them to their community, environment and peers. After gaining a sense of belonging in their community, students learn the skills of a responsible leader and master the techniques for project design and management. The group then employs the knowledge they have acquired to develop and implement independent, sustainable community projects. The group culminates its SURF experience by learning that generosity is rooted in one’s intention to care for the common good of a community. After graduating, youth participants become SURF mentors for future SURF generations, ensuring the sustainability of the program and living the knowledge and skills developed throughout their participation in the Four Waves. The KETO Foundation is a “non-profit organization focused on the study of biology, management and conservation of marine and coastal resources.” KETO uses its research on marine ecosystems in Osa to teach SURF youth the importance of aquatic management and conservation. The KETO – University of DUKE – SURF partnership empowers youth through marine education and interactive excursions such as snorkeling, whale watching and beach clean-ups, providing youth the opportunity to engage and build a relationship with their Marine Protected Areas (MPAs). Bahia Aventuras is a boat and nature tour operator in the national parks and reserves located in the Uvita-Bahia Ballena area. SURF partners with Bahia Aventuras to augment students’ experiences studying the marine life in their community with boat tours and other excursions into the protected areas. Bodhi Surf School in Bahia Ballena utilizes the incredible resource of Marino Ballena National Park to provide a unique surfing experience focused on a mind-body-earth awareness. Bodhi Surf provides lessons for SURF participants, introducing them to the national park and helping them build ocean awareness and confidence in themselves. Outside The Lens (OTL) is a San Diego-based organization that works to “engage, educate and empower youth on issues affecting the world today” by promoting youth literacy through the arts. SURF has partnered with OTL to bring dynamic photography and multimedia projects into the SURF curriculum that encourage students to reflect on the role they play in their community. La Cusinga is a “coastal rainforest eco lodge dedicated to marine and terrestrial conservation and environmental education.” Located in Bahia Ballena, Osa, the lodge has obtained four out of five leaves marking certified sustainable tourism. La Cusinga maintains private trails to primary rainforest through which they lead SURF students on educational walks. Staff also teach SURF students about sustainable hotel operations. GISETC has spent the last ten years providing workshops, software and curricula for both educators and students. GISETC provides SURF students with GPS hand units and teaches the students how to use GIS and GPS mapping techniques as a tool to map their community’s resources.